This billboard is ironic and darkly funny. 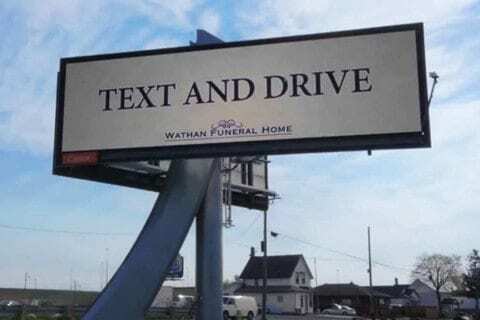 The billboard is advertising for a funeral home and tells people to text and drive. This implies that by texting and driving you are risking your life. A funeral home tells you to text and drive, ironically, so that they get more business. The billboard uses a dark humor to give out a positive message. Argument is Everywhere-Billboards by Jacob is licensed under a Creative Commons Attribution-ShareAlike 4.0 International License. Argument is Everywhere- QuicklistArgument is Everywhere- Daily Schedule.